See, it's an extremely primitive tricorder. 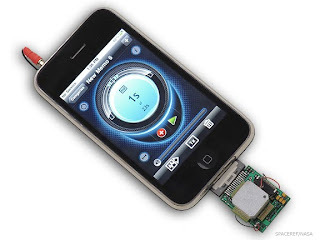 To make it, just connect a chemical sensing mechanism to a cellphone (here it's an iPhone) to display the information, and you're good. This device is capable of detecting and identifying low concentrations of airborne ammonia, chlorine gas and methane. Not all that useful for the average person though. What would really sell among the non-scientists of the world would be something that could determine the nearby air quality. A thermal sensor giving images like this would also be useful to homeowners - the thermal sensor wouldn't have to be all that impressive, just enough to tell where certain leaks are letting in hot or cold air into a house. Wikipedia has a few examples of some other primitive tricorders here, but none of them are quite snazzy or convenient enough to have become popular - having to buy a completely new device usually just isn't worth it. Create one by connecting to an existing cellphone though, and you have something worth developing.